This DVD was released on Abraham Lincoln’s birthday in 2009, the Lincoln Bicentennial Year. The re-dedication of the memorial on May 30th, 2009 marked ‘four score and seven years ago’ from the original dedication on May 30th, 1922. A very appropriate time frame. The exterior marble in the memorial, including the columns, is all Yule Marble from the Colorado Yule Marble Quarry in Marble, Colorado, USA. This documentary covers the history of the hidden treasure of the Yule Quarry from its beginning to the modern day workings of the men, women and machines deep inside Treasure Mountain. Also included is the history of the old marble finishing mill which was the largest and best equipped of its kind anywhere in the world. The Tomb of the Unknowns in Arlington, VA, has been cracked beyond repair and the search for the exchange block came back to the Colorado Yule Marble Quarry where the current Tomb Monument was quarried. This DVD is the only documentation of that search. Numerous historic photos highlight the story, some unseen for over a hundred years. Since the release of this DVD, attempts have been made to repair the damaged Tomb and only time will tell how long these repairs last. Stone experts the world over say that it will not hold. The Final Quarry Tour narration is done by Yule Marble expert, Gary Bascom, who worked within the mountain of marble for over 20 years. Tours of this historic quarry are no longer allowed due to government and insurance requirements. Historian Oscar McCollum, Jr., narrates the history of the old finishing mill giving us firsthand insight from his visits to the quarry and mill in 1941. Quarry employee Bob Collier narrates the working quarry with his firsthand knowledge of the machines that help extract the marble. In the search for the Tomb segment, I bring attention to the unacceptable condition of the current Tomb Monument and the need to exchange it for a block that is in keeping with the mission of Arlington National Cemetery, as well as the complete three year search for the perfect exchange block. The DVD is capped off with a tribute to our national treasures. I served as the photographer for the Tomb Restoration Project at the quarry in Marble and have been documenting this historic site for 12 years, now having the exclusive rights to shoot inside the storied property. 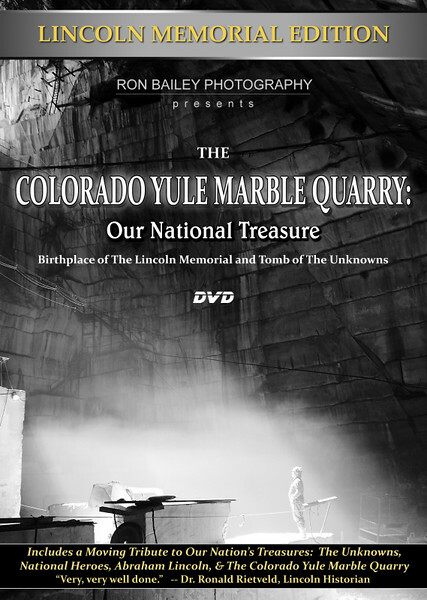 This DVD is the definitive work on the Colorado Yule Marble Quarry (what is now referred to as the 'Old Quarry'), abandoned marble finishing mill and search for the Tomb exchange block. The run time is 3 hours and 24 minutes, with each segment standing on its own to be watched separately if desired. This ‘Lincoln Bicentennial Edition’ of the DVD includes a direct copy of the only surviving “Lincoln Memorial Edition” of the old Marble Booster newspaper, which was printed in 1916 while the quarry was still extracting marble to be sent to Washington, D.C., for the completion of the memorial. Many changes have taken place at the quarry since 2009 with two new openings in the mountain, the first in over 100 years. Two more are planned for 2015. The new quarry, 'The Lincoln Gallery', will be featured in a new DVD to be released by Ron Bailey Photography in 2015. Several years ago, R.E.D. Graniti acquired the rights to the quarry and brought with them generations of successful quarrying methods that were new to the Yule Quarry. With the application of these new methods, the quarry gained at least another generation of productivity. The new DVD will also feature the new methods and machines now used in the quarrying process. The preview above was filmed in standard definition while all current videos are HD.